Heat a cast iron skillet over high until very hot. Sprinkle steak with salt and ¼ tsp pepper and set aside. Add butter and swirl to coat skillet. Place steak in skillet and cook to desired degree of doneness, about 4 minutes per side for medium rare (or until internal temperature reaches 130°F). Move steak to a cutting board and brush on both sides with ½ tbsp Shoyu. Let rest 5 minutes. While steak rests, whisk together remaining 3 tbsp shoyu, lemon zest and juice and remaining ¼ tsp pepper in a medium bowl. Slowly stream in oil, whisking constantly until thickened. Arrange lettuce and fennel on a large platter. Top with radishes. 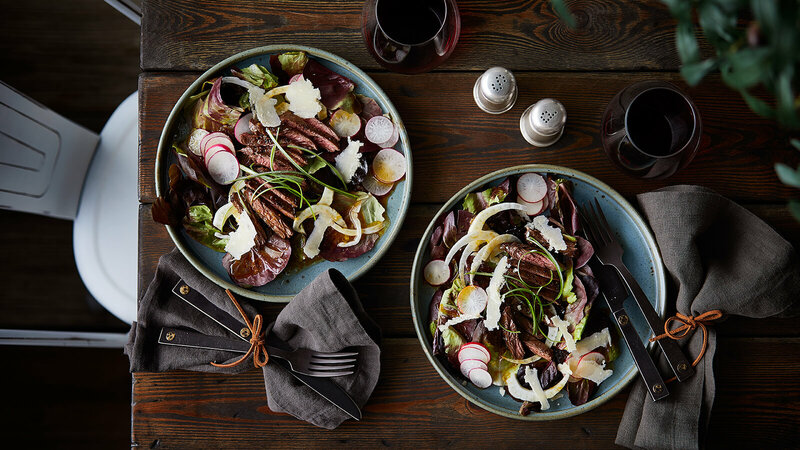 Thinly slice steak against the grain and arrange over salad. Add parmesan overtop steak. Sprinkle with chives and drizzle with ¼ c of dressing. Serve with remaining dressing.